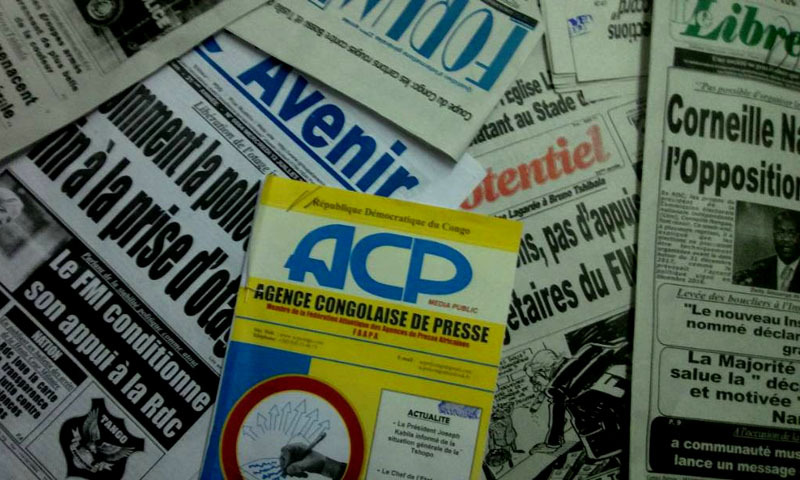 Kinshasa 11-02-2019 Press review - The election of the DRC president as vice-president of the African Union is the most exploited subject in newspapers published in Kinshasa on Monday, which also evoke the letter of Martin Fayulu, one of the unfortunate candidates for the Presidential election of December 30, 2018, addressed to African Heads of State gathered at these meetings. "Fatshi, a first international success", FORUM DES AS mentions. At 32nd Summit of the Union (AU). Yesterday, the Heads of State have forgotten everything and recognized the election of the new president of the DRC, notes this newspaper which considers moreover: "May be good news for Kinshasa". The post of 1st Vice President, which rightly belonged to Southern Africa, was entrusted to Felix Tshisekedi. The latter continues: "Fifth President of the DRC, Felix Tshisekedi was the attraction of everyone. Everyone wanted to see whoever succeeded in peace to Joseph Kabila and during a civilized transfer of the power between an incoming and outgoing Head of State. In addition, L'AVENIR explains, it was also expected in terms of speech, to know what he will say, especially about those of his counterparts of the AU who wanted to contest his election. In his article "Félix Tshisekedi, the star of the Addis Ababa summit", LE POTENTIEL, which is also interested in this subject, notes: "Handshakes here, hugs there, everyone in Addis Ababa was eager to approach Joseph Kabila's successor in the DRC. Felix Tshisekedi now embodies the renewal of Africa. Barely adopted in the closed circle of Heads of State of the African Union, he was named as 2nd vice-presidency of the pan-African organization for the year 2019, rejoices this tabloid that "In the Ethiopian capital where the 32nd summit of the African Union closes on Monday, President Félix Tshisekedi stole the show from all his counterparts ". For LE POTENTIEL, following the 32nd AU summit, the DRC marked its big return on the African scene. With her, all Africa is embarking on a new era that of a continent committed to emergence. And in the DRC, the awakening of a country long in agony has a name, it is Felix Tshisekedi. "About the letter of one of the unfortunate candidates in the presidential election of December 30, 2018, addressed to the African presidents, Fayulu and writes to the Heads of State gathered at the AU summit". "Fayulu lost the second round. "This title is from AFRICA NEWS. "In the following day of the duel of the Institutional Court where he was dismissed, for lack of evidence to prove his alleged victory, candidate LAMUKA got a new defeat at the AU following the election of President Felix as 2nd Vice President, synonymous, for this newspaper, the adoption of the new president of the DRC by his counterparts. AFRICA NEWS, recalls that "the other bad news for Martin Fayulu fell Friday February 9, 2019, when through a correspondence addressed to president Felix-Félix-Antoine Tshisekedi, the AU greeted his election".